Our swimming pool fencing installations include our patent pending walk-thru easy access self-closing, self-latching baby gate. This self-closing, self-latching safety gate which is key-lockable for added protection is available in multiple colors and comes in 4 foot or 5 foot heights. With over 20 years of experience in manufacturing and installing pool safety fences, Arizona Pool Fence has tried various types of safety gates for strength and durability. With tens of thousands of safety gate and pool barrier installations nationwide, Arizona Pool Fence has found that in order for safety gates to stay within adjustment, your gate should not be tension reliant on the fence. That is why Arizona Pool Fence actually puts their gates in a framing system. This allows the gate to be stand alone, or monolithic. It’s not tension reliant, thus it’s designed to stay within adjustment which means better protection against accidental drowning. Arizona Pool Fence has put safety first with our gate design. Arizona Pool Fence also installs the key lockable magna latch on the inside of the gate to keep out of children’s reach. If a child were to somehow be able to pull up the magna latch on an unlocked baby gate, the gate also opens away from the pool, thus the child who would have to be standing on something to get them to the height of the latch would not be able to open the gate as it opens in, not out. This is just another layer of protection that Arizona Pool Fence offers with our self-closing baby safety gates. 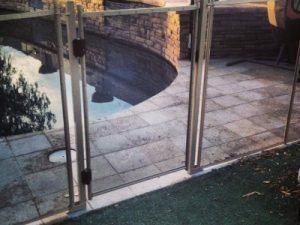 In addition, our professional pool fencing installers can place your pool fence baby gate anywhere you would like for easy access to the pool area. Your Arizona Pool Fence gate can be retrofitted to any type of fencing, block or stucco should you be in the market for just a Pool Gate. 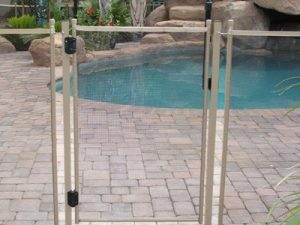 All Arizona Pool Fence gates come with the magna latch system. Although our mesh pool fence comes with the option of a manual gate, it is much safer to go with the self-closing safety gate. As parents, we tend to be more cautious than others so we are more likely to always remember to close the safety gate correctly with the manual gate entry. However, what about the swimming pool service employees or landscapers? Friends or relatives that come over to visit? Older siblings? What about any else who may enter the pool and not close the gate correctly? Not everyone thinks like a parent. Arizona Pool Fence always recommends to be safe rather than sorry and install a self closing gate. Arizona Pool Fence has a great self closing gate, one that comes with a lifetime warranty. This way you can always be assured that your gate will function properly. Both Arizona State and City requirements mandate a self closing gate to your pool. So if you’re thinking of manual versus self closing gate, our recommendation is to go with the self-closing gate. You will not have to ever ask the question, what if my gate is not closed correctly? Get the self-closing safety gate that Arizona Pool Fence offers and have peace of mind that you have the safest pool fencing in Phoenix.